The amount of web browsers increases each day, and the vast majority of them try to oust the rival products by implementing hundreds of new options, but there are other projects that focus more on simplicity and speed when it comes to browsing like Sundance Web Browser. The interface of Sundance Web Browser stands out due to its simplicity and to how quickly it allows you to browse, because it uses a floating browsing bar, that has the added benefit of having transparency applied to it, in such a way that it won't bother the user while browsing. Find out the latest news in a matter of seconds with its integrated RSS reader. Furthermore, Sundance Web Browser has a small side bar on the right-hand side from which it's possible to access all the main options that it includes, among which it is worth highlighting an interesting WYSIWYG editor to customize the websites that are visited most and an RSS reader with which the user will always be able to know the latest news and the changes to their favorite websites. 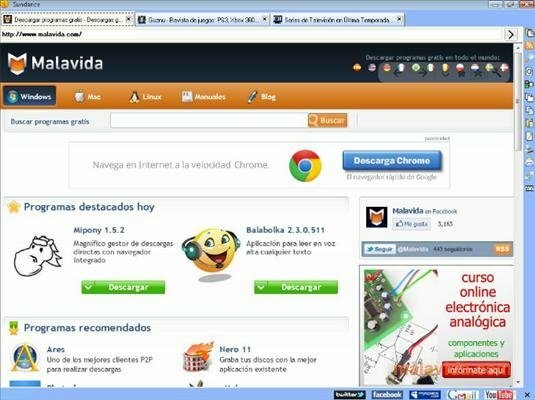 Therefore, if you're looking for a simple Internet browser that is easy to use, download Sundance Web Browser.